Santa Maria in Vallicella, also called Chiesa Nuova, is a church in Rome, Italy. The first church on the site was built sometime in the 6th century, and by the 12th century was dedicated to Santa Maria in Vallicella, or “Our Lady in the Little Valley”. The church was rebuilt in 1575. 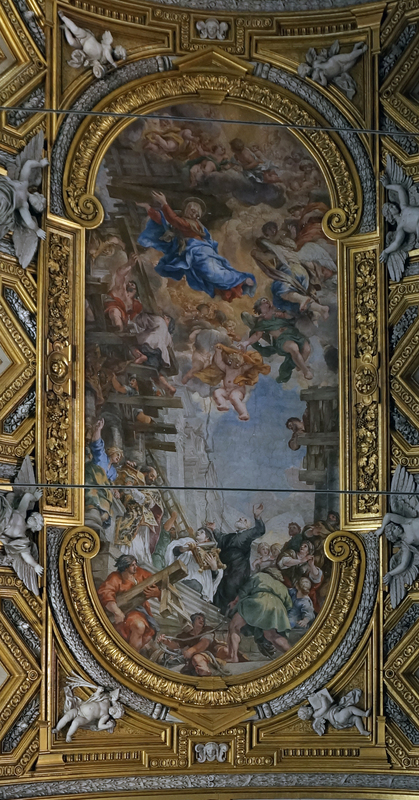 Of particular note are the ceilings by Pietro da Cortona, one of the great artists and architects of the Roman Baroque. Cortona painted the ‘Trinity’ in the dome from 1647-51, the four prophets in the pendentives below the dome in 1655-56, and the ‘Assumption of the Virgin’ in the apse. The fresco in the nave of the church is the ‘Miracle of the Madonna della Vallicella’, executed by Cortona from 1664-65.